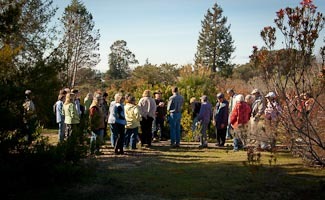 The UC Santa Cruz Arboretum & Botanic Garden’s mission is connecting people with plants. With a 135 acre living museum full of rare and unique plant species, dedicated staff, committed volunteers, and a voluminous history of contributing to conservation research, the Arboretum inspires botanical stewardship in students, the community, and the world at large. The UC Santa Cruz Arboretum & Botanic Garden’s rich and diverse collection contains representatives of more than 300 plant families of Mediterranean climates. The garden maintains collections of rare and threatened plants of unusual scientific interest. Particular specialties are world conifers, primitive angiosperms, and bulb-forming plant families. Large assemblages of plants from Australia, New Zealand, South Africa, and California natives are displayed on the grounds. Many of the species in these collections are not otherwise available for study in American botanical gardens and arboreta. Watch a video narrated by Frans Lanting, noted wildlife photographer, explaining the unique value of the Arboretum & Botanic Garden. The Garden's activities in importing, selecting, and breeding choice ornamental plants is of great service to the public and the nursery industry. The Garden is the original importer of more than 1,500 different selections of choice ornamentals. 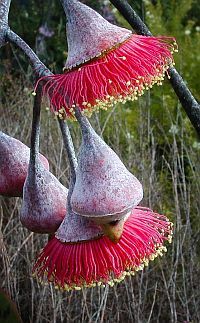 For example, see the Garden's Koala Blooms Program. Become a member to support the Arboretum’s valuable contributions and to join the community of avid plant enthusiasts. Learn how volunteers have played a crucial role in the Arboretum & Botanic Garden's first fifty years. Norrie's Gift & Garden Shop, a volunteer-run gift shop, supports the Garden and is open every day the Garden is open from 10 a.m. to 4:00 p.m.